Revolution can be counted as one of the most impassioned, high-quality bouldering companies in today’s market. They are constantly redesigning and tweaking their products to improve the caliber and function. For this year, they’ve refaced the Mission pad, a large taco-style pad that is a direct descendant of the classic Cordless Large Crash Pad. First, Revolution has done away with the big velcro flap closures used in the past and replaced them with flaps that easily cinch down with buckles. The velcro tended to attract leaves and dirt, and was a bit hard to tear apart when opening the pad, so this new closure is a big improvement. There are also side, top and bottom closure flaps, ensuring that none of your gear will ever spill out. What may be the Mission’s best feature is its carrying system. Not only are the shoulder straps adjustable to fit three different torso lengths, but they are sewn onto a flap—as opposed to the pad itself—that acts as the pad’s top and bottom closure flaps. This offers a few benefits. 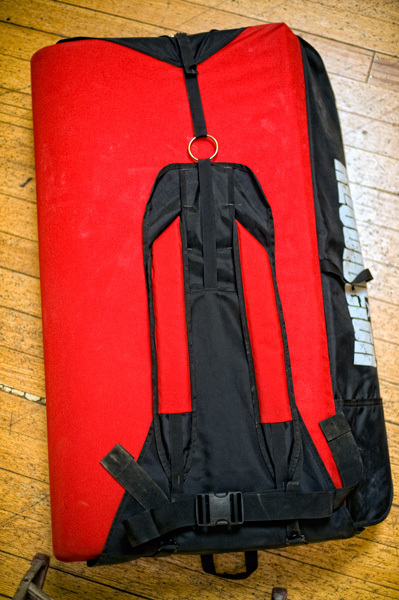 When you open the pad, the backpack/harness flap rolls up and can be stowed. 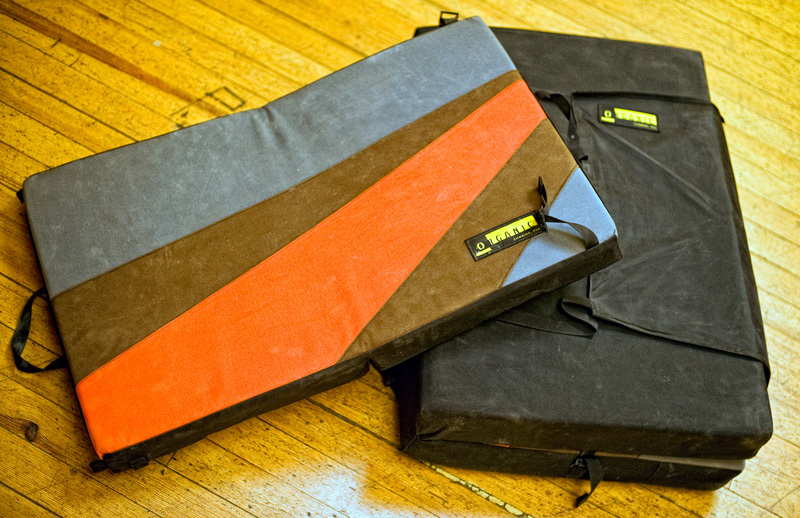 This allows you to protect muddy landings without subsequently getting your back dirty when you pack up and leave. Carrying the pad, I found it extremely comfortable, not just because of the nice padded shoulder straps, but also because the backpack/harness flap seemed to help the pad move with my body. I think if this heavy-duty nylon flap was made of something lighter and more breathable, and somehow provided a little separation between your back and the pad itself, it would be even better. That said, I had to be told how to close the Mission properly, as it was a little confusing at first. Now that I know what to do, I like the closure/carrying system a lot. Revolution uses the highest-quality foam on the market. Despite the Mission being only 3.5 inches thick, it felt just as sturdy and durable as thicker pads and seems to be much longer-lasting as well. 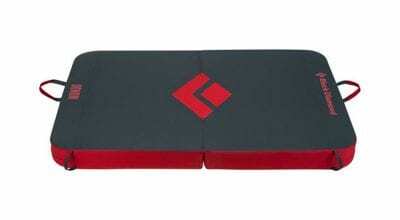 The landing deck is nice and large, providing outsize protection for a pad that is so light. However, its length kept it from fitting into my car’s trunk.